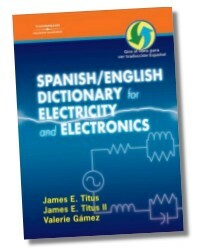 This one-of-a-kind resource provides quick access to important electrical and electronic concepts in both Spanish and English. A useful training tool for beginners, and a valuable on-the-job reference for experienced electricians and electronic technicians, the Spanish/English Dictionary for Electricity and Electronics addresses the need for clear, concise communication within a multilingual workforce. Accurate, effective communication is critical in these fields where safety and environmental issues are addressed daily; this dictionary becomes an indispensable resource that is unlike anything else on the market. The book's handy, easy-to-use format makes this a must-have for every electrician's toolbox, and a valuable addition to every office that has Spanish - and English - speaking technicians working together in the field. James E. Titus holds a Bachelor of Science degree in Education from Southwest Missouri State University and a Master of Science degree from Central Missouri State University. James E. Titus II holds an undergraduate degree in Modern Foreign Languages from Graceland University. He earned an MBA in International Business from Park University. Valerie Gamez holds a Master of Arts in Interdisciplinary Studies and is an Academic Advisor in the College of Science, Mathematics and Technology at the University of Texas at Brownsville and Texas Southmost College.